118 Gingerbread "Splendid." Mrs. Marsh. 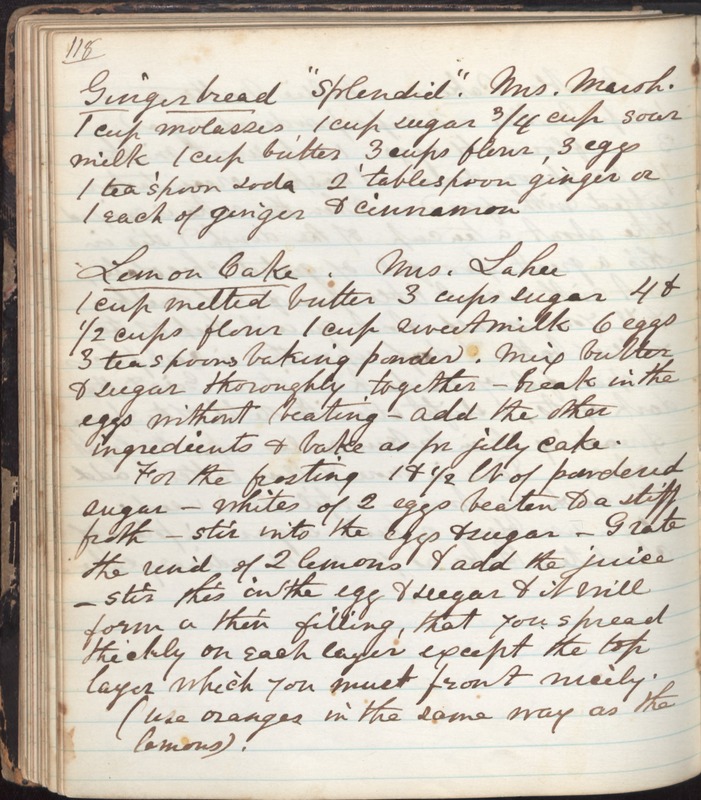 1 cup molasses, 1 cup sugar 3/4 cup sour milk 1 cup butter 3 cups flour, 3 eggs 1 teaspoon soda 2 tablespoon ginger or 1 each of ginger & cinnamon Lemon Cake. Mrs. Laker 1 cup melted butter 3 cups sugar 4 & 1/2 cups flour 1 cup sweetmilk 6 eggs 3 teaspoons baking powder. Mix butter & sugar thoroughly together -- break in the eggs without beating -- add the other ingredients & bake as for jelly cake. For the frosting 1&1/2 lb of powdered sugar -- whites of 2 eggs beaten to a stiff froth -- stir into the eggs & sugar. Grate the rind of 2 lemons & add the juice. Stir this in the egg & sugar & it will form a thin filling, that you spread thickly on each layer except the top layer which you must frost nicely. (use oranges in the same way as the lemons).